Are you looking for a once-in-a-lifetime holiday, rather than a once-a-year-in-the-same-resort holiday? Don’t settle for a cocktail by the pool if you’d rather get your kicks riding camels, seeing incredible archaeology and hanging out in a destination loved by filmmakers and photographers. Tempted by a bit of the extraordinary? If so, make Petra your next getaway. This Jordanian city, which dates back to the year 6BC, has been described as being ‘half as old as time’, and you’ll certainly get a sense of the past as you explore its beautiful facades, which were carved straight out of the rocky landscape by the Nabatean Arabs. With views as amazing as these, no wonder it’s on the list of UNESCO World Heritage sites. So, how do you enter this magical place? Is there a secret passage or a hidden entrance? Not quite. You must walk through a gorge, called the Siq, which covers just over a kilometre and leads to the city itself. Of course, the best way to travel along the Siq is on foot, but if you have mobility problems then a horse-drawn carriage can be arranged. Once inside the city, you can hire a donkey, a horse or a camel to see the sights. Petra’s camels in bright colours are hard to ignore. 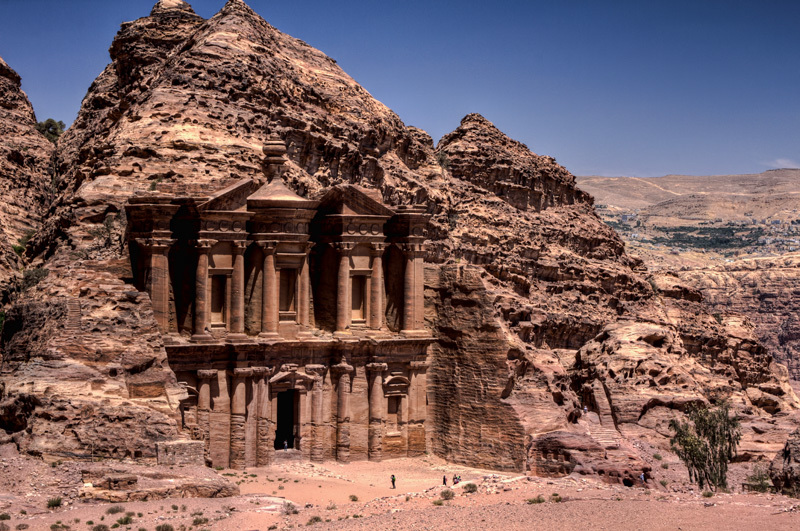 Petra was abandoned by the Romans and the crusaders and then fell into obscurity. It was discovered by modern civilisation 201 years ago, when a Swedish explorer called Johan Ludwig Burckhardt came across it during an expedition across Egypt and Arabia. Even now, it’s estimated that only 15% of the site has been properly examined by archaeologists. More recently, fictional explorer and all-round action hero Indiana Jones headed to the Treasury (or Al-Khazneh), which stood in for a temple in Indiana Jones and the Last Crusade (1989). The Treasury is one of the most popular places to take a photo; it dates back to the 1st century and is 43 metres high. By night it is lit up with hundreds of candles placed on the floor, which creates a really beautiful atmosphere and subtle lighting for you to capture on camera. You can take a special night tour to make the most of this. You may wish to avoid the stifling summer temperatures and opt for spring or autumn visits to make the best of the weather (and avoid winter snow!). If you’re a keen photographer then start your adventure early in the day or at dusk to reap the benefits of perfect light conditions. You should expect to spend a few days exploring if you want to make the most out of your visit. Whatever your price range, there’s an option for you. The Petra Guest House Hotel has a 4* rating and an enviable location: right beside the entrance to the Siq! The Movenpick Resort Petra is a 5* property with luxurious facilities, including a tea room, a swimming pool, a gym and spa treatment rooms. All inclusive options are available here. The Marriott Petra, which has a 5* rating, overlooks a stunning valley and boasts a Turkish bath, sauna and outdoor pool for guests to use. There are several restaurants to choose from at this hotel. There are many attractions to catch your eye inside the city, including temples (such as the Garden Temple and the Great Temple), palaces and tombs. After passing the Treasury, you will reach the Street of Facades, which is a wide space decorated with carvings to represent the tombs that lie beyond. When you get right into the heart of Petra’s ancient buildings, you will see the Nabataean Theatre on your left hand side. This incredible structure would have seated thousands of people. The Girl’s Palace, constructed in the year 1BC, has managed to survive any major earthquake damage thanks to the clever building processes used to protect it from tremors. Wear sensible clothing that is designed to cope with desert climates. Of course, your choice of footwear is also important – go for sturdy shoes that have been designed for walking and hiking. Keep hydrated with plenty of bottled water once you arrive, and don’t forget to keep your sunglasses, sun cream and hat handy. Just some of the souvenirs you could bring home. Of course, you could easily fill a suitcase with standard souvenirs like fridge magnets and bookmarks, but there are some far more unique things that you should be bringing home for yourself or for friends and family. Look out for jewellery workshops selling pieces made by local women’s collectives; you will also spot many stallholders selling homeware, postcards and kefiyas, which are brightly coloured headscarves. If you have enough room in your case, why not consider buying one of the intricately patterned rugs often found here? Some of the most popular souvenirs from Petra are glass bottles filled with coloured sand, manipulated using a knitting needle and a funnel to make amazingly detailed pictures. You can watch craftsmen making the designs in front of your eyes, and sometimes they will personalise the design for you by adding your name written in the sand.